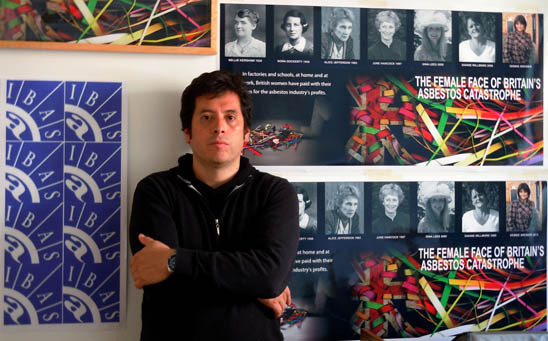 Interpretation of "The Female Face of Britain's Asbestos Catastrophe"
In an exclusive interview with Laurie Kazan-Allen (LKA), he explained the genesis of this work. LKA: How did you become interested in asbestos? GV: Besides being an artist, I write about art in particular about the institutionalization of art; that is the relationship between art institutions, museums, collections etc., and artists and the framework set by these institutions within which art circulates and how these discourses can take on another meaning when they enter into a specific collection or experience an alteration in symbolic interpretation. In the course of my research, I discovered that the most important collection dedicated to Latin Américan contemporary art, the Daros latinamerica collection, belonged to Stephan Ernest Schmidheiny, one of two defendants in criminal proceedings brought in Italy over the deaths of thousands of asbestos victims. Many of the works in Schmidheiny's collection were created by so-called political artists. I believe this collection is ideologically-motivated, intended to whitewash the owner's image and that of his vast business network in Latin America. It's a kind of Artwashing. I wrote an article about this apparent anomaly which I hoped would elicit a response from these artists. What I discovered in this investigation was so shocking that I began to read deeply about the global asbestos tragedy. I carefully followed the developments in the great Italian asbestos trial. During this time, I contacted you (Laurie Kazan- Allen); you helped me understand the background to the trial and the global asbestos status quo. LKA: What was the inspiration for this project? GV: On the IBAS website, there was an article which told the story of British women killed by asbestos. Reading this and seeing the pictures of these seven women affected me. I asked myself how could I communicate this horror, this fight and this hope as a visual narrative. This was the inspiration for this digital piece. I sketched out my thoughts in a very free imaginative way and sent the initial image to you (Laurie); your enthusiastic response encouraged me to continue to refine my thoughts. Guillermo Villamizar in his studio in Colombia. I used the seven photos of the women mentioned in the IBAS paper, a union jack and some photos of colored paper which reminded me of small asbestos fibres. Lets remember that at the beginning, asbestos was sold as a magic mineral, a false promise of modernity. The techniques used included photography, 2D and 3D digital design. LKA: What did you want to achieve with the Female Face? GV: The primary aim was to communicate this British tragedy. I also hoped this image could be useful for campaigners, people like the mesothelioma activist Debbie Brewer who worked so hard to raise awareness of the widescale and tragic nature of asbestos suffering. In our concept, I had planned to show Debbie's photo in color; the only one of the seven images not in black and white. This was to highlight the fact that her battle with asbestos was ongoing. Debbie's sudden death was a hard blow. I had become so familiar with her image after months of working on this project that I was not able to let her go. So, although we put in the year of her death (2013), we left her photograph in color  her presence remains strong as does her memory. LKA: I believe this piece is part of a larger concept; please explain your thinking about this? GV: The whole idea is to tell in visual terms, the history behind asbestos at all levels. When you began to think about strategies to fight against asbestos you find different spheres of action; the ramifications of asbestos exposure are multi-faceted and include legal, scientific, labor, economic, political, health, environment and medical issues. I want to produce twenty pieces which will reveal a panorama of the asbestos tragedy; from the invention by Ludwig Hatschek of the asbestos-cement process to the condemnation of Schmidheiny in the great asbestos trial of Turin, incorporating the contribution made by Dr. Irving Selikoff, the fight for justice by the workers in Casale Monferrato, and other key topics. LKA: What is the ultimate goal for your work on asbestos? GV: The ultimate goal is, of course, an asbestos-free world, but this will not happen overnight. For example, in my country an asbestos mine is going to be re-opened and last year asbestos consumption increased by more than 20%! No one in the government is talking about the hazard of asbestos exposures. There are no educational programs or plans to teach the public or workers about asbestos hazards. The same situation exists elsewhere; in India, asbestos is regarded as just another raw material. If we do not speak up about the dangers then we too are complicit. The work of IBAS and its partners deserves to be known wherever asbestos is being used. I was so surprised when I read, in an IBAS article entitled Turkey Marks International Workers Memorial Day, that the first public workshop on asbestos had taken place in Istanbul. I felt so proud of this kind of activity and so privileged to be part of a network supporting the ban asbestos campaign. The challenge faced by all artists is one of interpretation and communication: how to build a bridge between reality and imagination through a visual discourse. We need to create a transformative experience which can impact on the perception of the human experience, but equally we must as artists try to affect not only human perception at a private level but the real world too. I know it is a bit idealistic but I am conscious that art alone cannot change the world; artists need to work with political actors and civil society stakeholders to create a framework within which change can take place. That is why this project seems so important to me as an artist and a human being. 1 Barnett L. Tate Modern's women's liberation army. January 29, 2013.